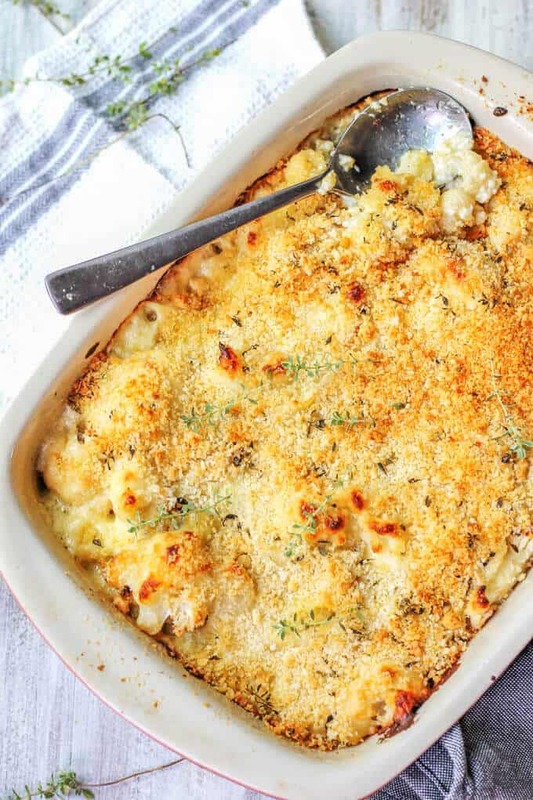 Cauliflower Pasta Bake with Brie and Fontina is like a combination of a fancy mac & cheese with veggies! Two dishes at ones. 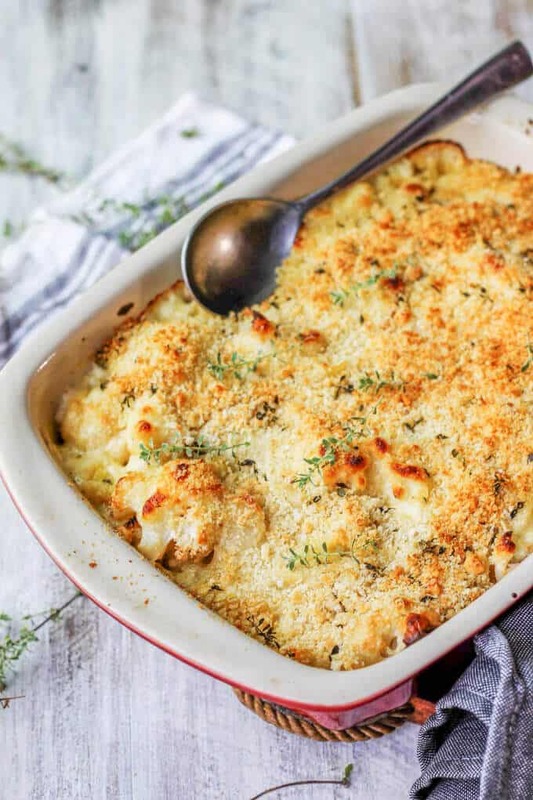 This Cauliflower Pasta Bake is made up of tiny pasta shells with roasted cauliflower, and an out of this world cheese sauce with Brie, Fontina and freshly grated nutmeg. 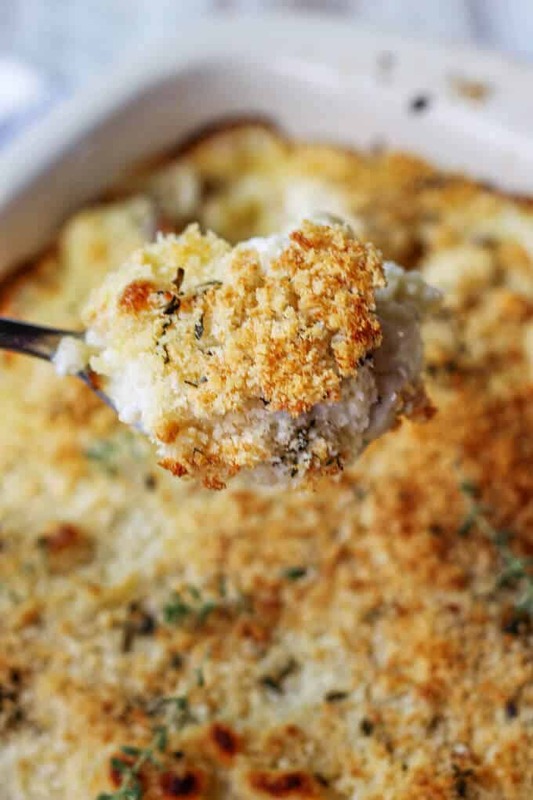 And the best part comes next…it’s topped with a combination of Panko breadcrumbs, Pecorino cheese, and fresh thyme. The crunch from this adds such an amazing texture to the otherwise creamy dish. This is by far my most favorite cauliflower dish that I’ve ever made (and it’s a cauliflower season here in NY). I bought a beautiful head of cauliflower in a local grocery store, just chopped from a farm on the east end of Long Island. I couldn’t be happier. 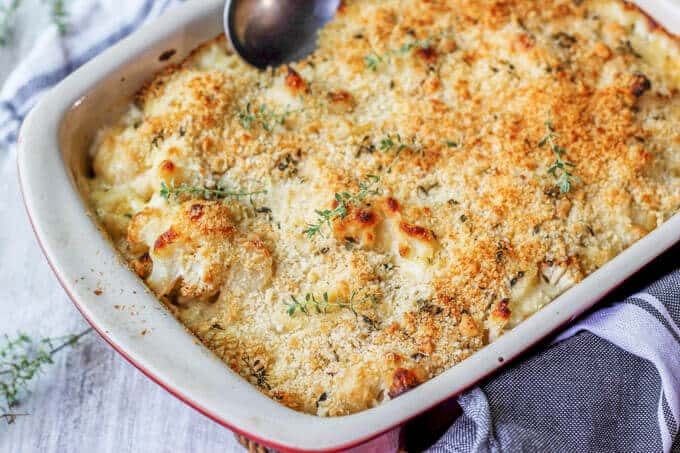 This Cauliflower Pasta Bake was so good that both, my husband and I were sneaking into the kitchen for bites while the dish was cooling off. We just couldn’t stop ourselves. Mind you, this isn’t one of the healthiest dishes, but it’s surely a tasty one. It has A LOT of cheese! You can’t eat too much of it, but I think that once in a while you should indulge yourself with something super decadent. 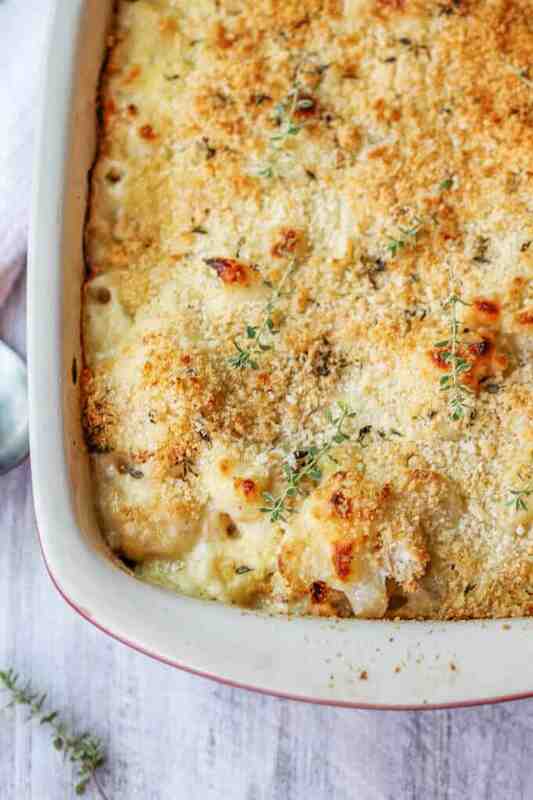 This Cauliflower Pasta Bake can be served as a vegetarian dinner or as a side dish. Both work great. I probably mentioned this before, on a couple of occasions, but my husband can be fussy eater when it comes to veggies. He, on the other hand, would argue with this statement and tell me that he likes ALL the vegetables except cabbage, brussels sprouts, beets, zucchini, kale, dark greens and a couple more. And he caveats his appreciation of broccoli & cauliflower, only providing an exception if they’re “cheesy”. When I made this Broccoli Au Gratin, he looked at me and said: these were some serious broccoli. So I’ve figured out the trick of getting beautiful veggies into him. I need to smother them with a cheese sauce. About this sauce. Oh gosh… I never imagined that the cheese sauce could be this good. I made a basic bechamel; then added brie, fontina, freshly grated nutmeg, and seasoned it with salt & pepper. I’m telling you, this is really extraordinary! Who would’ve thought about adding brie to a cheese sauce? I did! I cut off the rind and used only the creamy inside. It melted beautifully. And Italian fontina is one of my favorite cheeses. It has a little nutty flavor and it melts great too. I used small pasta shells to capture all the sauce inside them and make every bite count. I also roasted the cauliflower before adding it to the pasta. There’s something magical about roasted cauliflower – or roasted vegetables in general. They taste so different than steamed or boiled ones. Roasting keeps the juices inside, bringing and intensifying the natural veggie flavor. But the crunch on top takes it to another level. Panko is super crunchy when baked, but I mixed it with Pecorino cheese and fresh thyme. Pecorino is a sheep’s milk cheese, with a little tangy punch. Trust me when I say, this combo is “the bomb”! In fact, I’m so happy with this recipe that I just want to do a happy dance now. Even though it may require a number of steps, the preparation is actually very easy. Follow the instructions in the printable recipe below and you’ll be golden. This dish is best served fresh from the oven. If you have leftovers, the best would be to heat it up in the oven for about 10-15 minutes until warm throughout. Caution: the microwave could dry out the pasta and the panko will not be crispy anymore. If you have a big dinner party, you can prep it ahead of time and just put it in the oven when the guests arrive, to make sure that it’ll taste the best. 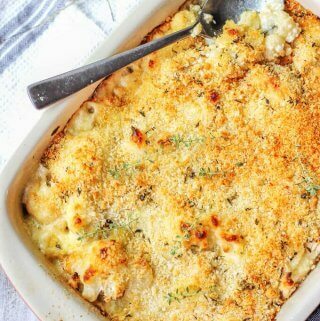 Cauliflower Pasta Bake with Brie and Fontina is like a combination of fancy mac & cheese with veggies! Two dishes at ones. Let it cool off slightly before serving. Enjoy! This looks so creamy and delicious! I love cauliflower so this is perfect! Wow this recipe is faboulous!And you are putting together my two favorite kinds of cheese, can’t wait to try. The combination of cheeses you used here is absolute perfection. Cauliflower has yet to ripen around my area, I’m looking forward to trying this recipe when it is in season! This looks very comforting! And I love the use of cauliflower here! Haha, your husband sounds a good bit like mine!! I, too, have found the “smother it in cheese sauce” method to be most effective. 🙂 This dish looks utterly fantastic. Comfort food that still allows me to get a few veggies into everyone. I’ve pinned and can’t wait to try soon! I love the creativity on display here with this cauliflower pasta bake. Love the way how yours turned out. Thanks for sharing this. Can this be made to the point of baking the night before and the refrigerated. I would keep topping aside until dish is baked the following day. Hi Shelley, I have never tried this and I’m not sure how the cauliflower would hold up. If you want to make it ahead of time, why don’t you prepare everything the night before and keep it separately? The next day assembles the dish before baking.